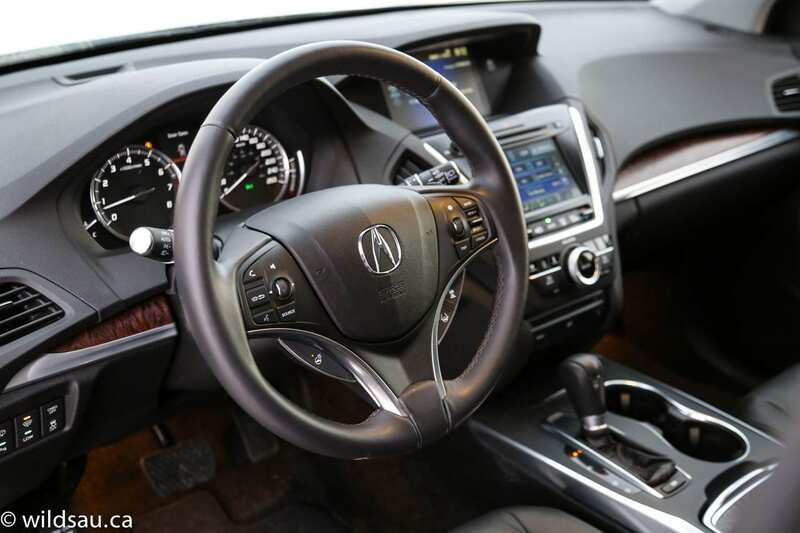 Acura has a new premium benchmark on its hands with the 2014 MDX, offering a full slate of luxury, comfort, performance, safety and technology. It can get expensive as you make your way through the trim levels, but it’s as smart and rewarding a vehicle as ever. 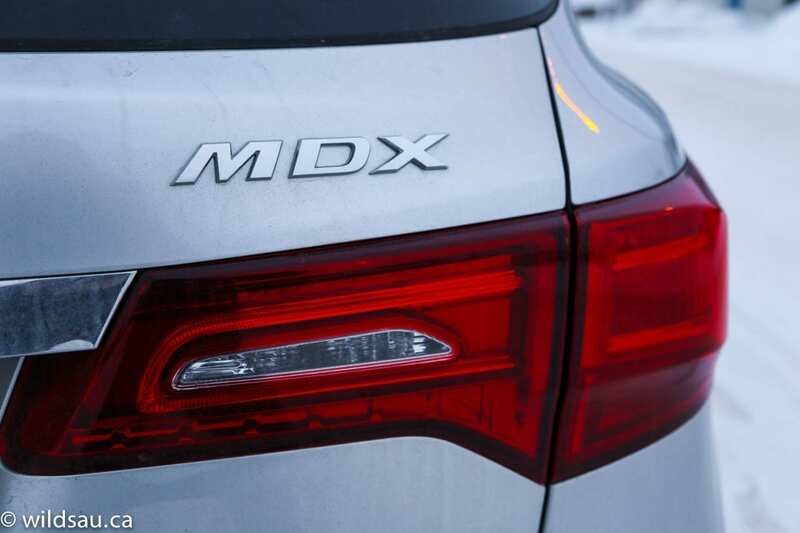 The “all-new” 2014 MDX is very clearly derived from the previous one. Though enthusiasts will quickly notice differences, the shape is without question evolutionary – and that is a good thing. It has always been a fine looking vehicle, and the newest one is no exception. Strikingly similar lines to the Lexus RX are immediately evident, especially as the roofline drops down through the tailgate and to the rear end. They are, after all, mortal marketplace adversaries and I suppose Lexus should consider this flattering. 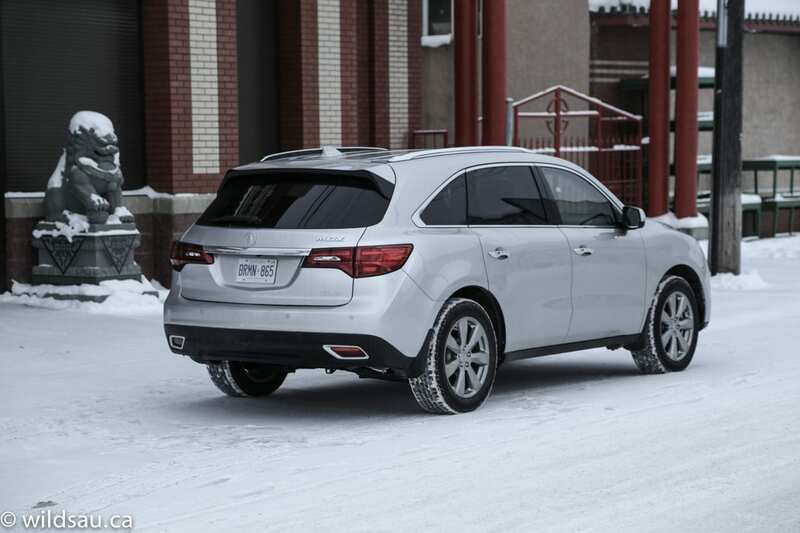 But the MDX isn’t a total copycat. It has a sophisticated and confident elegance about it, without giving up that little bit of tough-guy swagger. 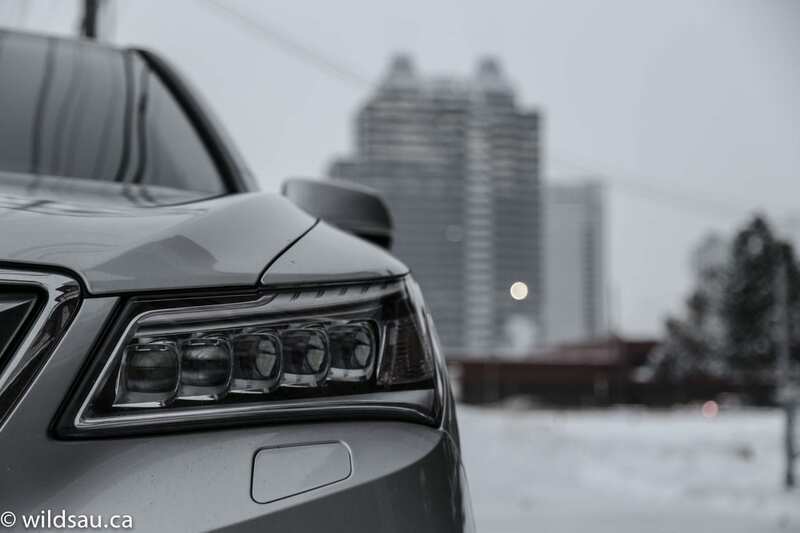 The front end gets Acura’s new jewel-eye headlight treatment, which you can see a mile away. They look cool and they’re quite effective. The beaky grille remains, but looks fine and the area below it is flanked by large, aggressive intakes. The side, deeply sculpted, is marked by an interesting character line that starts half-way up the back of the front wheel well and extends back midway into the rear doors. 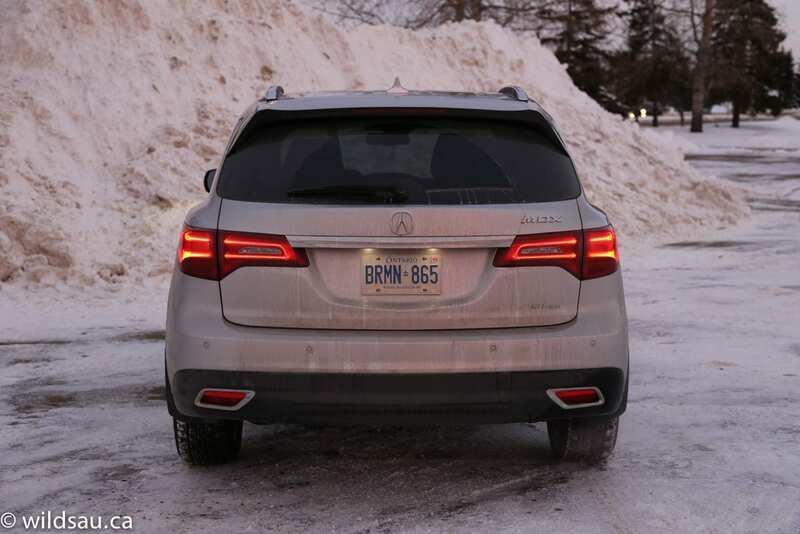 The rear end gets new tail lights that have a very signature in the dark, quickly setting the MDX apart from others. And for the first time ever, tail pipes are no longer visible – they’re integrated beneath the rear skirting, allowing for a slightly cleaner (if not tamer) look. The combination of 245/55-sized rubber and my tester’s 19-inch rims did a good job of looking meaty and performing well. 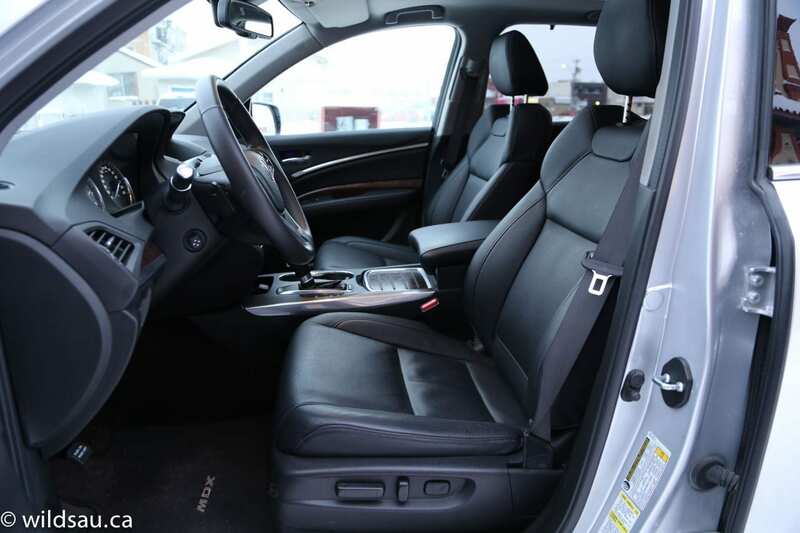 The MDX’s well-crafted interior makes a big impression right away. Beautifully textured and sculpted soft-touch plastics, combined with real wood trim and splashes of metallic brightwork come together to make this a luxurious, relaxing, effective cabin. 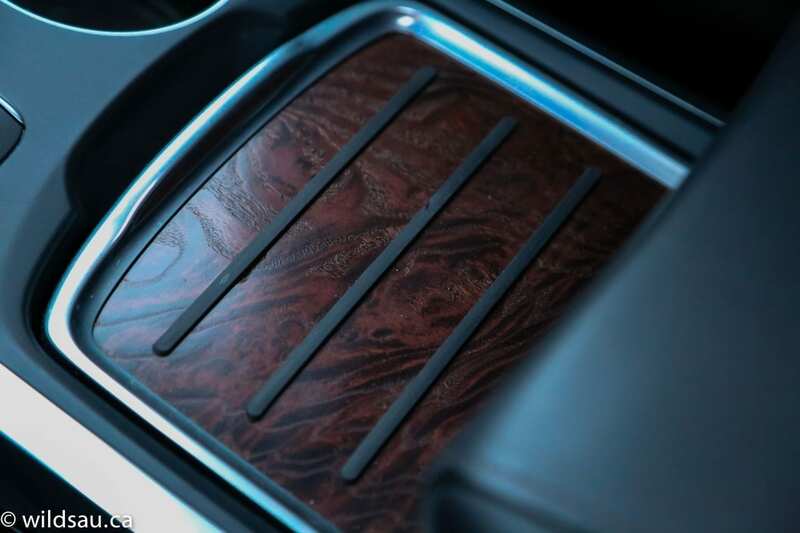 Fit and finish are outstanding, and the vehicle always felt as though it was carved out of a solid ingot. Head room is great, and you’ll find a nice mix of spaciousness and intimacy. The perforated Milano leather front seats are power adjustable, heated, cooled (with a driver’s side memory) and are as comfortable as they are nice to look at. 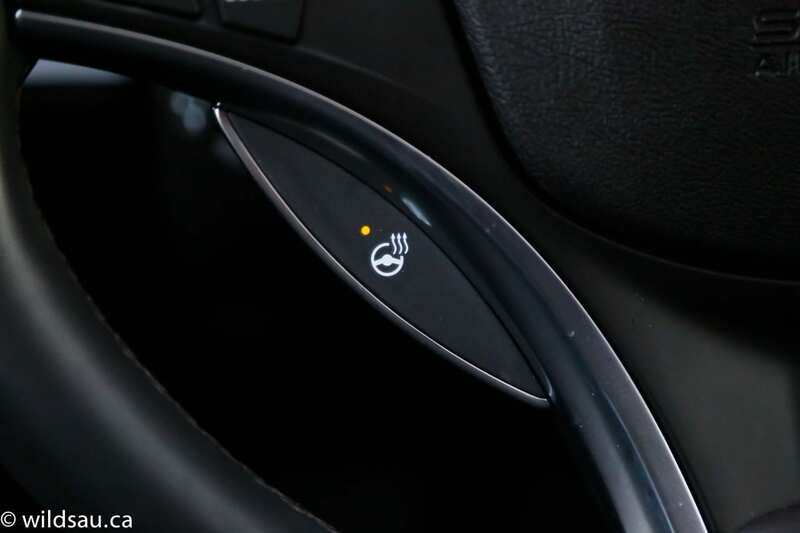 Ahead of you is a very, very busy heated and power-adjustable steering wheel – it has controls for media, phone, handsfree, driver information screen and trip meters, cruise, lane departure warning and on the back, paddle shifters. Phew! Behind the steering wheel are two basic gauges, separated by a sharp driver information screen. The centre stack starts with a large information screen in a hooded bin. Below it is the main-screen – it manages your front and rear media, navigation, phone, cameras, vehicle information and settings. You control it as a touchscreen as well as with a rotary joystick knob. It’s not the easiest user interface to grasp, but you slowly get used to most of its complexities and intricacies. The ELS audio system feeds off any source you can imagine and sounds absolutely spectacular – one of the best factory systems I’ve heard to date. 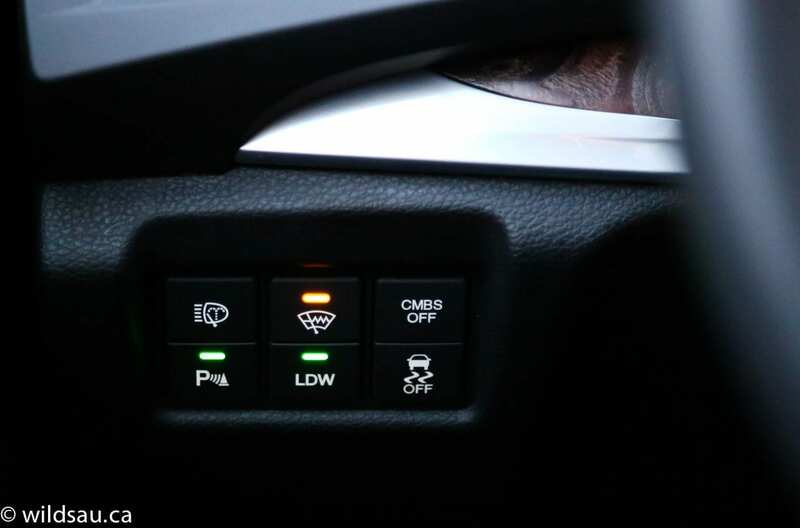 The bottom of the main screen is used as the display for the dual-zone automatic climate control system – you’ll find the buttons for it directly below the screen. The centre console is home to a 12v plug, your gear selector, two cupholders and an innovative armrest/storage bin combination. 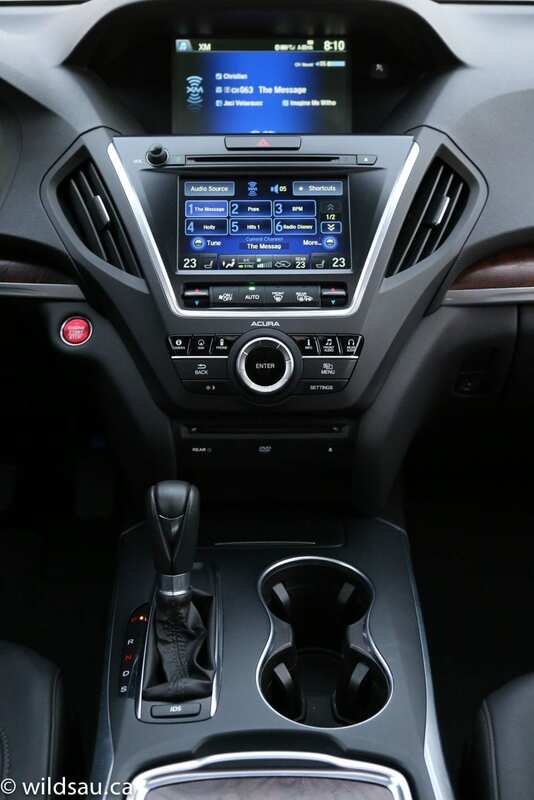 The MDX is outfitted with a complete suite of driver assistance technology – blind-spot monitoring system, lane departure warning and Lane Keep Assist, adaptive cruise control, collision mitigation braking system, Surround View camera system with front and rear parking sensors keep you and your passengers safe and sound. None of this tech seemed intrusive and much of it is defeatable if you so choose. Entry is keyless (for the rear doors too!) 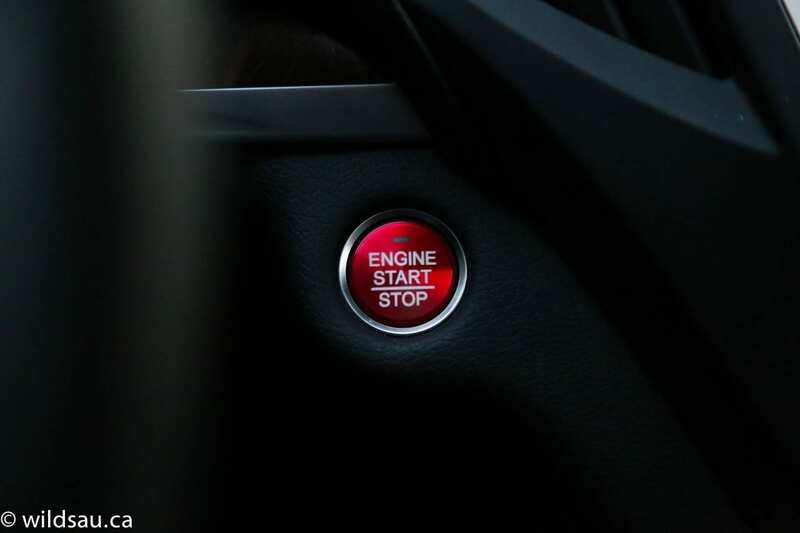 and there’s a push-start ignition. Overhead is an average-sized tilt/slide sunroof and you even get a remote starter. The second row of seating is a memorable one. There are three seats, each with a seatbelt and headrest. Extremely comfortable heated seats that recline and slide fore and aft offer ample head and leg room and a great view of the road ahead. The floor is flat, and the middle seating position (while narrower) is actually usable for adults. There are no lack of creature comforts for the second row. 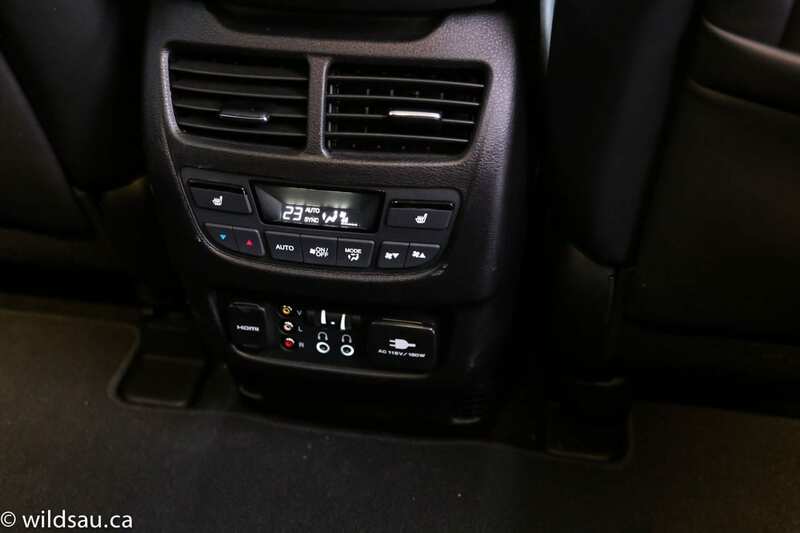 An automatic climate control system with adjustable air vents and a ludicrously huge 16.2-inch wide rear entertainment screen (with DVD player, HDMI input, removable remote and wireless headphones) are there to make the journey a cushy one. I appreciated the 115V household plug and the side sunshades too. 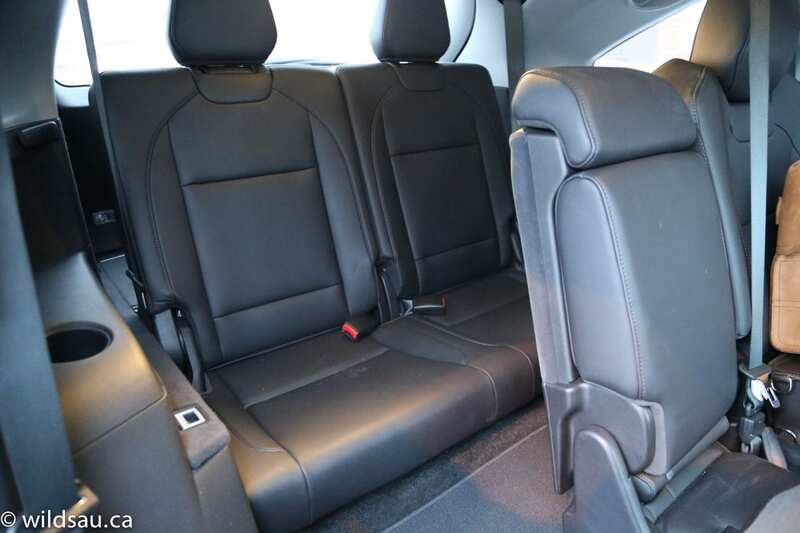 There are two sets of LATCH anchors for child seats, and our three kids comfortably fit into the second row, though the two older ones always wanted to sit in the third row – presumably to torment their little brother from behind. The third row is for two small people. But first, let’s talk about getting there. Smart Slide buttons fold and slide the second row seats forward. 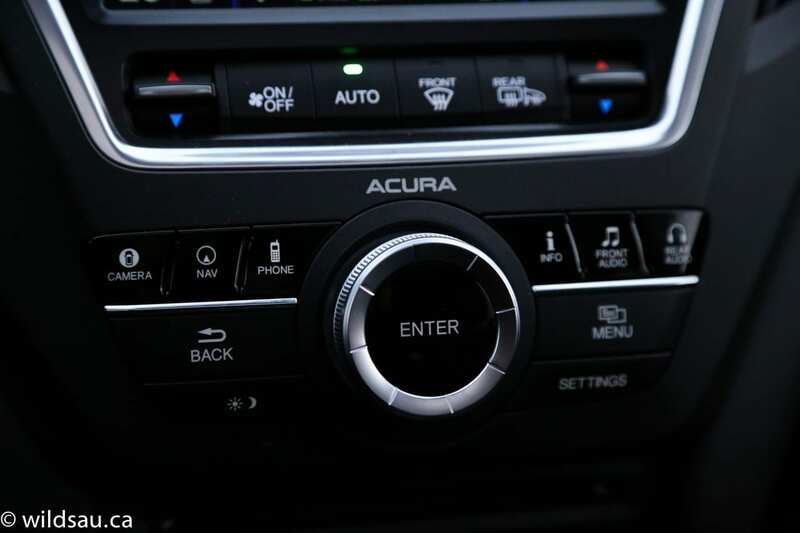 Acura has placed two buttons on either side of the second row seats – one on the back and one on the side – letting passengers easily move the second row out of the way from the back or from outside. Once you’re in, and the second row is back in place, it’s snug. Legroom is fine for kids, but never for adults. Headroom was just enough for me, at 5’10”. There’s nothing else going on back there, except for a couple of cupholders. There’s a power lift gate which you can control from the key fob, a dashboard button and buttons on the inside and outside of the tailgate. 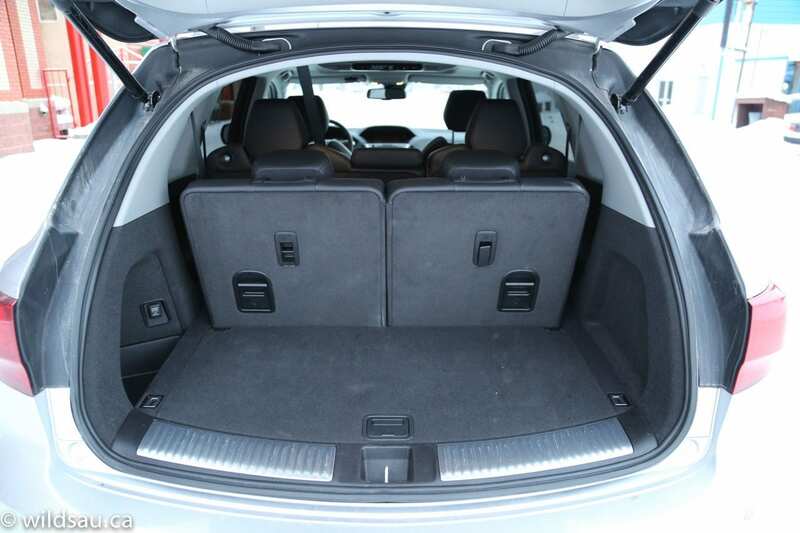 The trunk’s load height is comfortably high and the space is large. 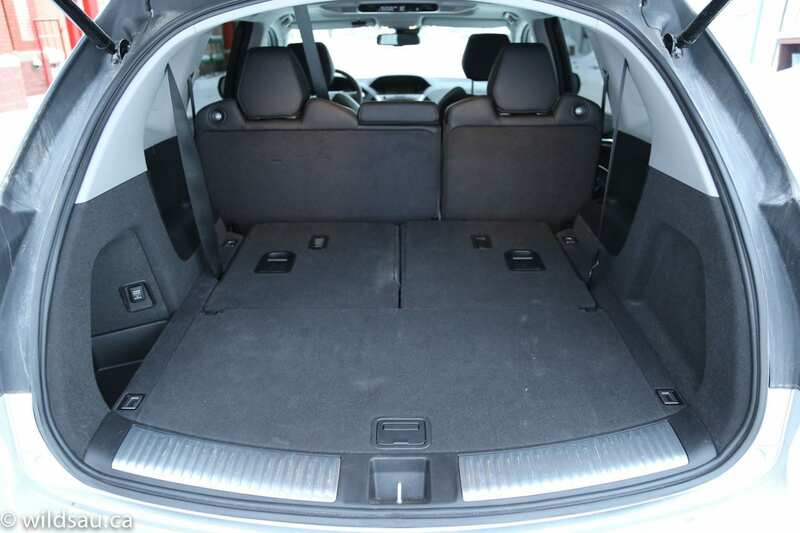 You even get useful space with the third row in use – 447 litres. Fold them flat (they split 50/50), and you’ve got a solid 1277 litre cargo room. Of course, if you need to, you can fold the second row down too (60/40) which results in a cavernous 2575 litre space. There’s also some underfloor storage and a 12V plug. You’ll find Acura’s proven direct-injection 3.5-litre V6 here. It cranks out 290 horsepower at 6200 RPM and 267 lb.ft of torque and sends its power through a 6-speed automatic and on to its SH-AWD – short for Super-Handling All-Wheel Drive. Something this big, heavy (1970 kg – 4343 pounds) and powerful isn’t going to do well in the fuel economy department. 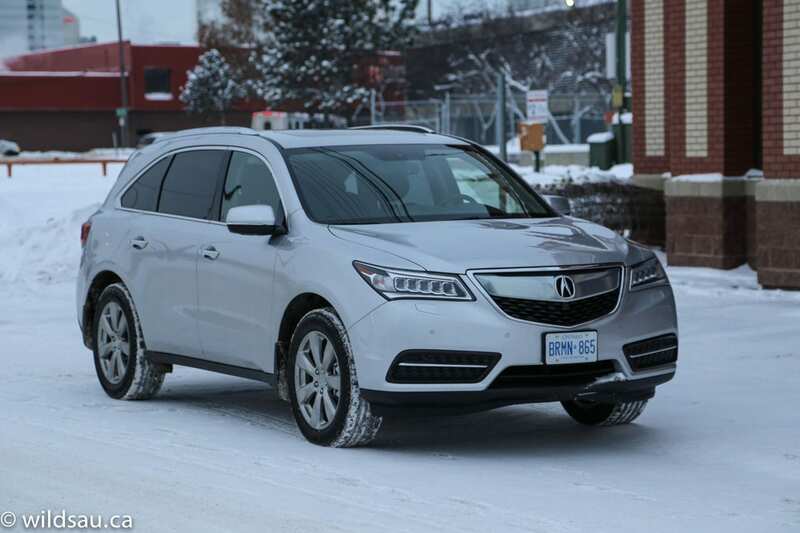 The MDX is rated at 11.2 L/100 km (21 mpg) in the city and 7.7 L/100 km (31 mpg) on the highway. During my week with it, it endured slow commuting through fresh snow, some freeway work and a highway run and averaged a sobering 14.8 L/100 km (16 mpg). The fact that premium fuel is recommended is no relief at the pumps – filling the 74 litre tank gets pretty pricey. If you need to, you can tow 3500 pounds with the MDX – that goes up to 5000 pounds if you buy the optional transmission oil cooler. The engine is powerful and though the transmission seems down on gears compared to some competitors, the pairing of the two seems nearly perfect during all driving situations. Smooth and unflappable for normal everyday driving, the drivetrain gladly steps up to the plate when you get on it, surging forward from any speed and pulling hard through the gears. The gears can be shifted manually using the paddles, but I found the transmission’s Sport mode more rewarding. It’s very effective, gladly holding gears much longer or dropping down to a lower gear quickly when it senses you are driving aggressively. I had the MDX during our first big snowfalls of the season. 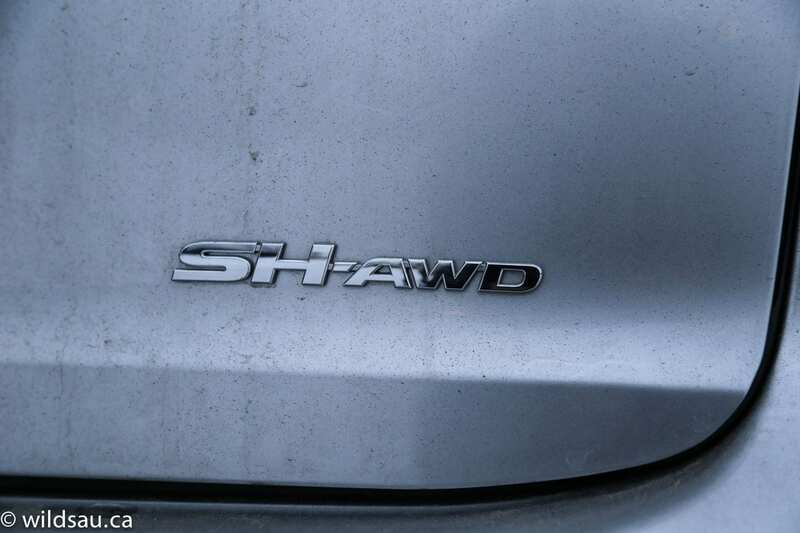 I’m a big fan of Acura’s SH-AWD. It’s brilliant from a dynamics perspective, always seeming to pick the right balance between safety and performance. 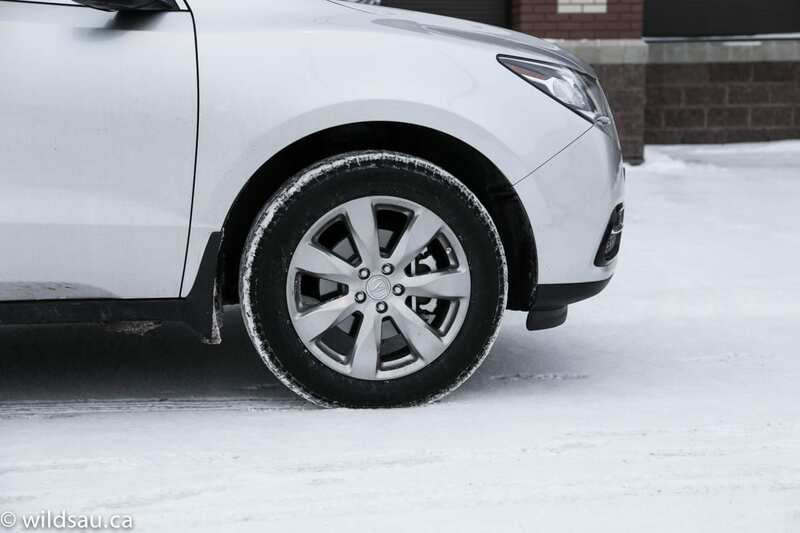 Traction is outstanding, even with all-season rubber, and it happily lets you play in the snow if you turn the traction control off. You can further tailor your driving experience with the IDS (Integrated Dynamic System) – it allows you to choose between comfort, normal and sport, altering the steering effort, throttle response, all-wheel drive system and even the sound of the engine. The ride is outstanding – it’s luxurious and smooth, soaking up the small and big hits alike, yet the big SUV never gets wallowy around corners or over dips. 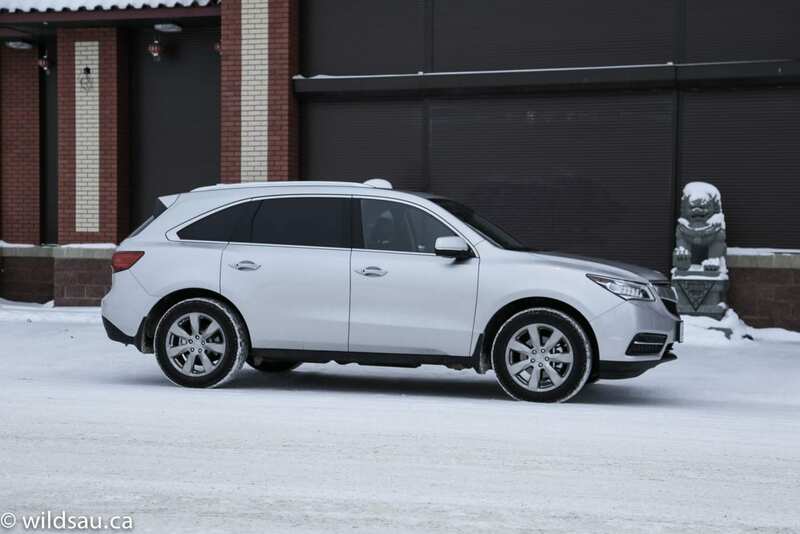 Not only is it well-controlled, but the MDX is a competent handler as well. It stays remarkably flat for a vehicle of its heft and height, and I was surprised at how eager it seemed to take on corners when I asked it to. It is an outstanding example of engineering overcoming physics in order to combine comfort and sport. Steering effort at parking lot speeds is almost impossibly light, allowing you to park using one finger if you want to. It tightens up appropriately as you increase speed, and I liked that the electronic steering never felt numb. It’s also quite easy to park with an impressive turning circle. Noise levels are very quiet. Engine, road and wind noise were essentially non-existent under all conditions, including at highway speeds. Very impressive. Visibility out of the MDX is pretty good, with a couple of exceptions. 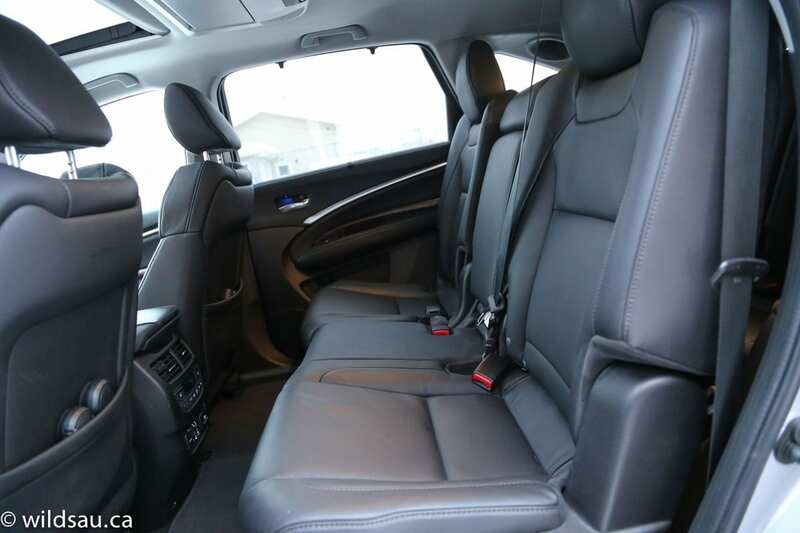 The rear view can be obstructed if the third row headrests are up and passenger-side shoulder checking isn’t a lot of fun – there are a lot of seats and a chunky rear pillar seeing to that. I think Acura has built a benchmark with the new MDX. A vehicle that has always been considered a smart purchase takes it up another notch. It is a premium SUV, luxurious and comfortable yet built for drivers, and absolutely bristles with safety and technology innovations. I give the 2014 MDX an 8.5 out of 10. WAF (Wife Acceptance Factor) was out of this world. I’d say that it was her favourite vehicle that I’ve reviewed to date. She was in love with the exterior as well as the interior. She enjoyed the driving position, the luxury and comfort and the ride as well as the significant trunk that easily swallowed the products of an entire day of shopping. Her only complaint was that she had difficulty with the user interface for the information screens. 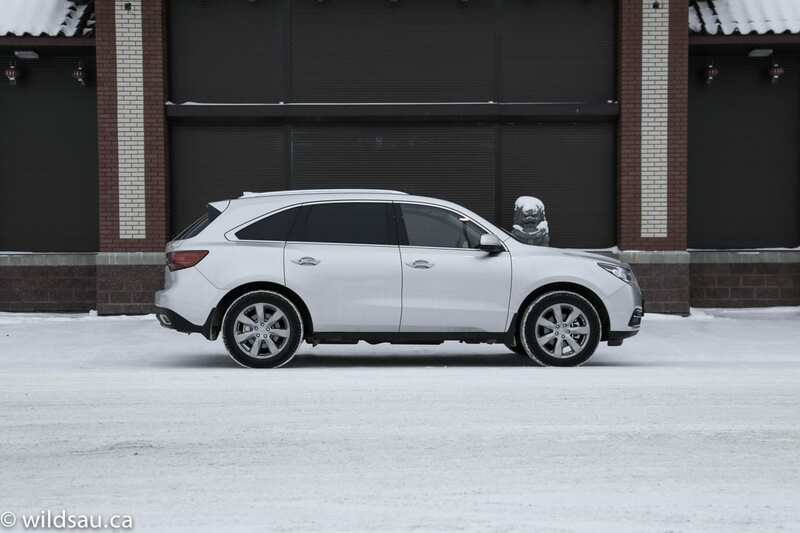 Considering its reputation for reliability and outstanding resale value, the fact that this model steps up its game in nearly every department over previous iterations, and that I had a tough time finding a single thing I didn’t like about the MDX, I would say my recommending the MDX feels like a gross understatement. If it fits into your budget, you’ll find much to love here. I want one!